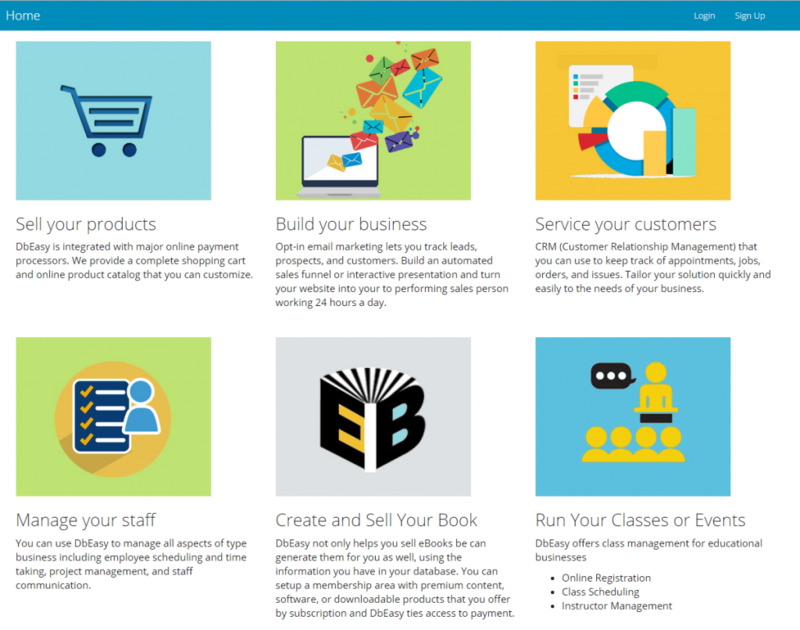 Start your journey to web business success with DbEasy. An example of a one-to-many link is Employees and Departments. An Employee belongs to one Department. A Department has many Employees. 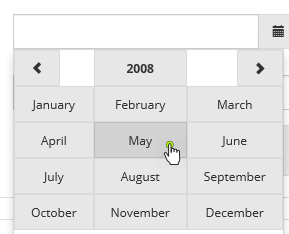 The usual way that DbEasy implements this is with a drop-down list. When you are on the Employee editor form you will see a drop-down list for Department. When you click the drop-down you will see a list of all the departments: Marketing, HR, Facilities, Customer Service, IT, etc. When you select one then you will have created a link between that employee and the Department table. An example of a many-to-many link is Students and Classes. A Student can have more than one Class and a Class will have more than one student. Another example is the Ageless Outings website. Ageless Outings is a guidebook of day trips within the greater Denver region. Each trip has a Destination. Each Destination can have one or more Restaurants nearby. A restaurant can be near more than one destination. 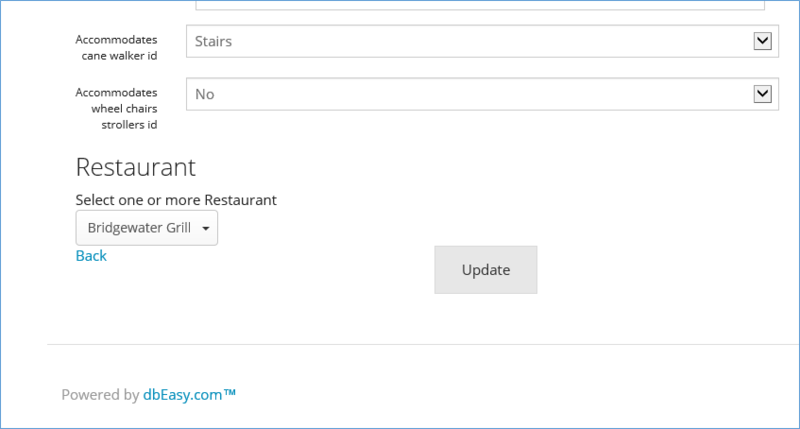 For the many-to-many link between Ageless Outings Destinations and Restaurants the DbEasy multi-select list provides the user interface for selecting multiple Restaurants for each Destination and vice-versa. When you log into DbEasy you will see that the main menu provides access to three main entities: City, Destination, and Restaurant. Destinations and Restaurants have a many-to-many relationship. A Destination can have one or more Restaurants associated with it. A Restaurant can be associated with one or more Destinations. 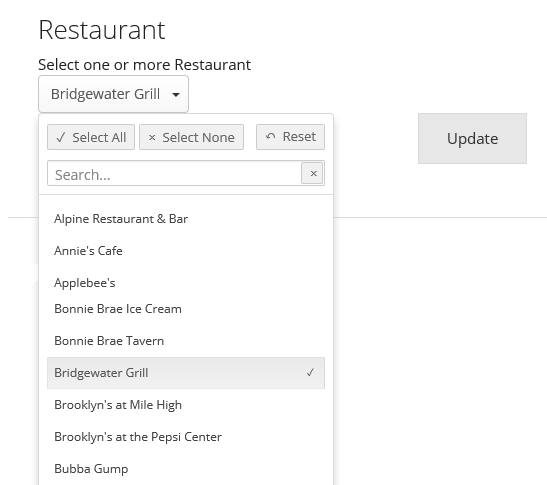 There is currently one restaurant selected, “Bridgewater Grill.” If you click anywhere on the button it will open the dropdown list. Notice the “Bridgewater Grill” is checked in the list. 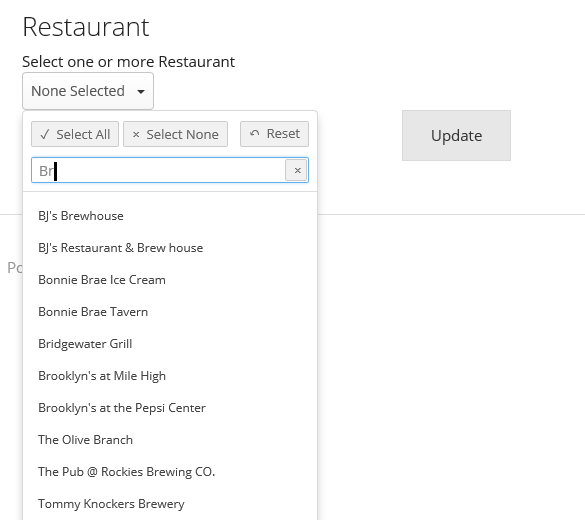 If you click other Restaurants then the multi-select dropdown will add them to the list of selected restaurants. 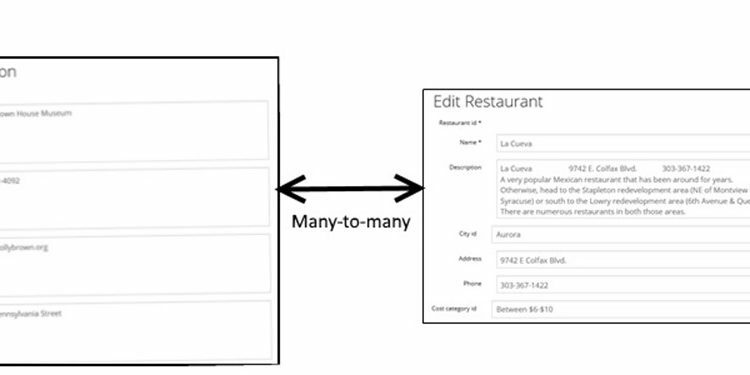 The multi-select control in DbEasy makes it easy to enter data when your database has a many-to-many relationship. 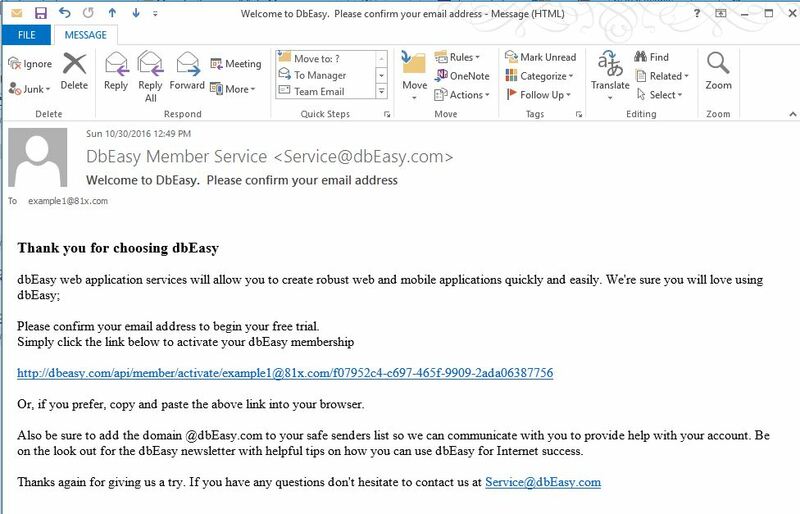 A link is just a URL to your form running on a publicly accessible area of the DbEasy website. Embedding is where you create a window or frame within your own website and the from appears within it. 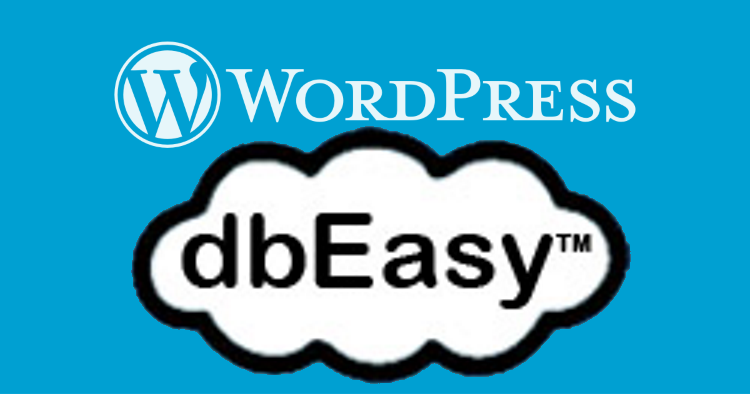 In the DbEasy form editor select the code for “Embed your form” starting at the “<iFrame” and going to the end “</iFrame>” and copy it into your clipboard by pressing Control-C.
Edit the WordPress blog post where you want to embed the form. At the top right corner on the WordPress editor there are two tabs, Visual and Text. Click Text. 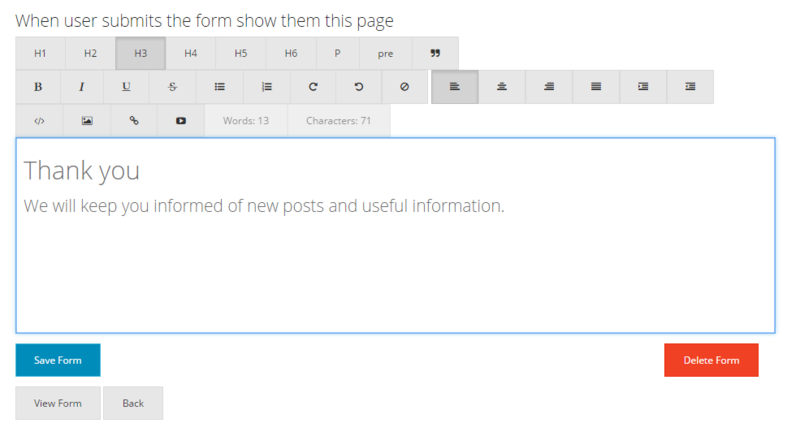 Paste the embed code into your blog article where you want the form to appear. Click the Visual tab and you should see your form appear like the example below. Publish your blog post and the from should appear and be usable. 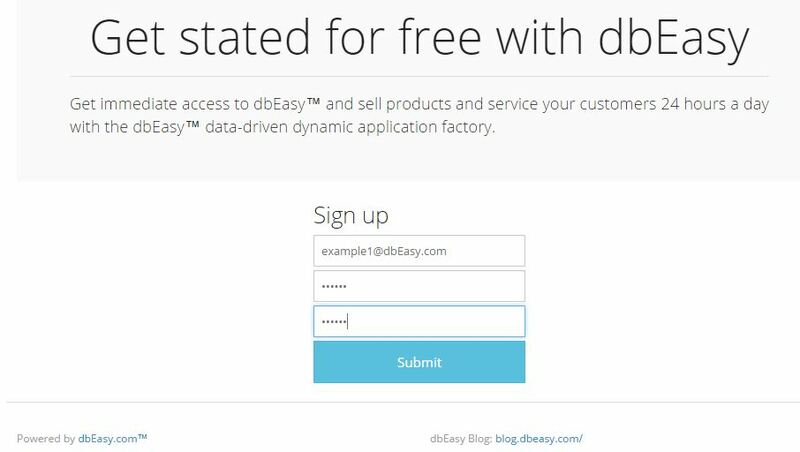 The DbEasy custom forms editor allows you to open up your database to world. 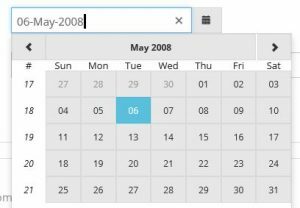 You select tables and fields from your database, define how they appear and then embed the form in your blog or website. This will take you a screen where you can select one of the tables in your database. 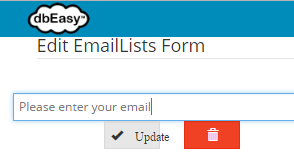 In this example we are going to select the EmailLists table so we can create an email address collection form. 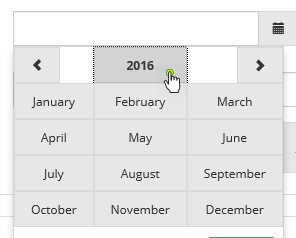 DbEasy will give your form a name based on the table you select. If you are going to have more than one form for the same table you give them unique names so that you can keep them straight. The user does not see the form name so it’s fine to leave it as is. When you click the Save Form then DbEasy will take you to the Form Editor. The Form Editor gives you a list of fields from your table and other features to control the appearance of your form. Type your new value and click Update. 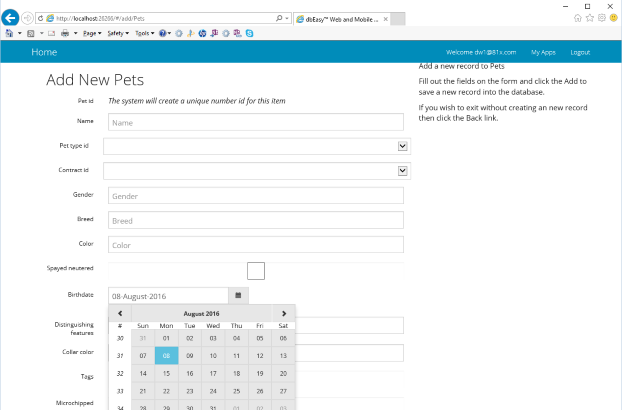 You can also change the text that appears on the button your user clicks to send the form. By default the button will have the dweeby label. “Submit,” but you can have it say anything you want. 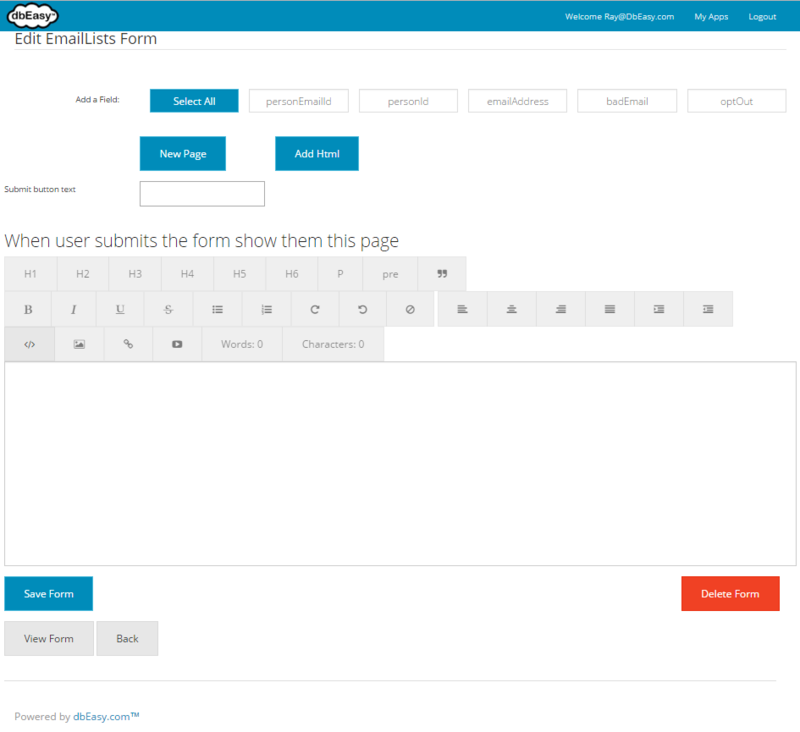 The last thing that you can customize is the page that appears after your user submits the form. For this we give you an HTML editor so that you can create rich formatted text. The HTML editor lets you choose text styles H1 – H6 (Heading 1 through Heading 6), text decorations like bold, underline, and strike-through. You can indent, use bullets, numbered lists, insert images and add links to other web pages. Basically anything you would find in a web page you can create with our HTML editor. 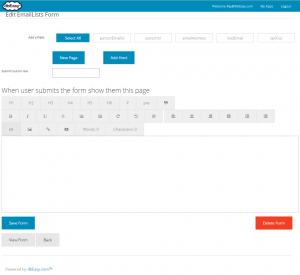 Now you can view the form and see how it will look to your users. You’ll be able to see all your customizations. You can even try it out yourself, entering data, clicking the button, and then you’ll see the response page that you designed. DbEasy makes databases easy. 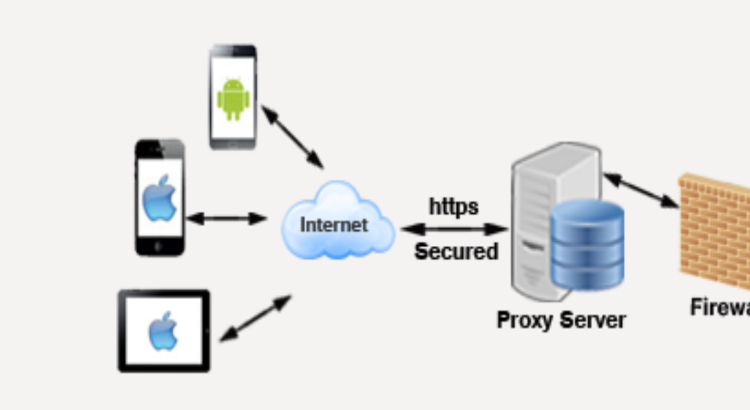 We provide database hosting with a dynamic mobile web user interface. What this means is that we provide you a “database in the cloud” that you can access from anywhere. Your data is secure, only accessible through your login. We provide you with basic editors that let you add, view, update and delete data with any of the tables in your database. We will cover all of the dashboard functions in a later post. 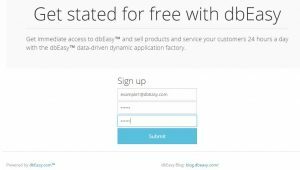 To get started with your own online database just go to DbEasy.com and follow the instructions in this post. The “Learn More” links to this blog because this is where we document all the news, features, and success stories for DbEasy. As we continue to develop new features and applications for DbEasy we will add to and improve the home page. 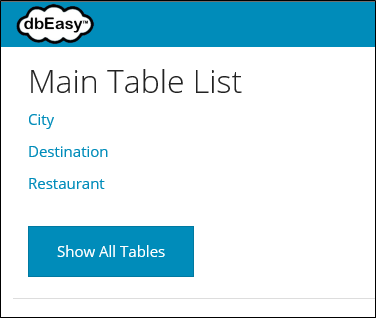 When you create a new table with DbEasy you can specify that some of the fields are required, meaning that you cannot save a record to the database unless you enter a value for those fields. Notice that First name and Last name are marked with asterisks. This means that those fields are required. You can have a person without a title, middle initial, suffix, email, or gender. But the minimum that we need to have is the person’s name, both first and last, for the record in the database to be useful. When you fill in all the required fields then you can save the record. 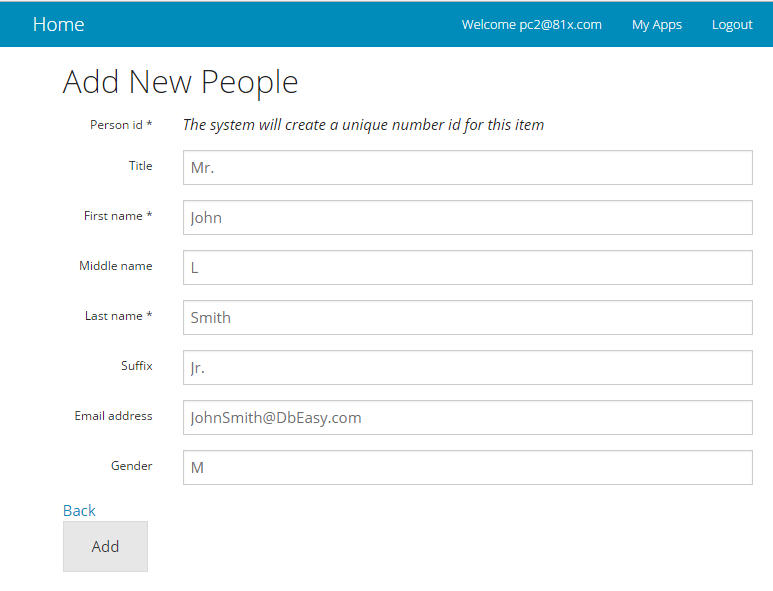 This is yet another example of how DbEasy makes it easy to create your own custom web application. You get clear, friendly error messages without doing any programming. 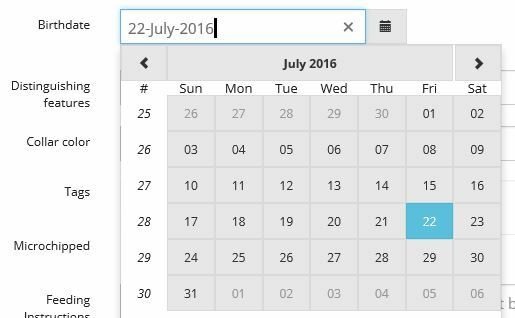 This calendar control is part of the Angular UI project. 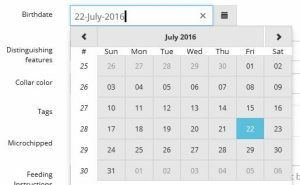 Remember, DbEasy is built with technology from Google and Twitter and the calendar control is one example. We find the best technology and learn all the nitty-gritty details so you don’t have to; you can just take advantage so that your website stands out as a great user experience. These are just a few examples of the DbEasy enhanced mobile web UI. We will be continuously seeking out the newest and best mobile web user experience and adding it to DbEasy so that you can use DbEasy to build your own great apps easily. AngularJs is an application development framework, created and fully supported by engineers at Google that is focused on data, especially from a database service like dbEasy. It allows us to create a rich and friendly web user experience. 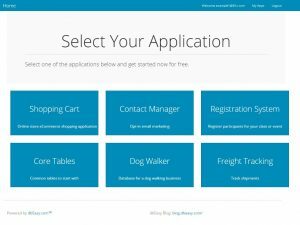 It provides the most modern user interface capabilities with interactive forms and data elements that will work on any device: computer, tablet, or phone. Bootstrap is a CSS framework created by engineers at Twitter for designing mobile-first web applications. It features responsive design that detects the viewer’s device type and screen size and then automatically adjusts the layout to provide the best user experience. 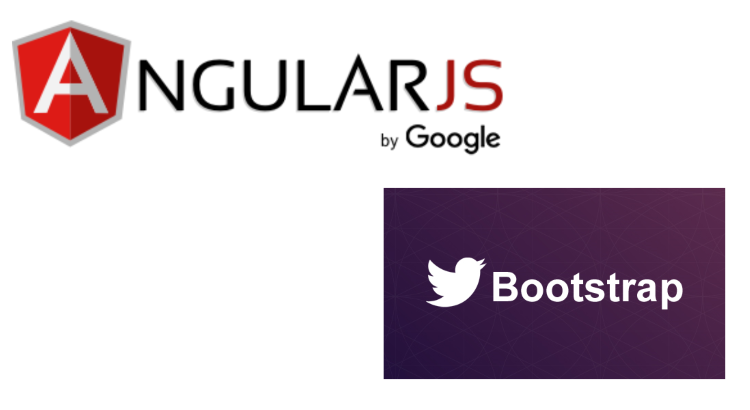 Angular and Bootstrap are part of the latest trend in web development, used by some of the largest and most popular websites and companies. The bad news is you need to be a programmer or web designer to take advantage of these tools for your website. If you are a small business person without a technical background or large IT budget then this great experience for your users is beyond your reach. Unless you are a dbEasy™ member. dbEasy takes care of the technical details for you. 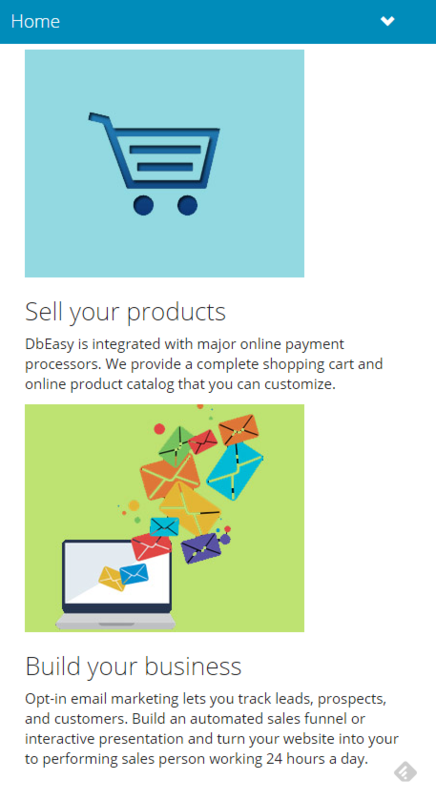 You choose what information you want to collect and provide through your website, what application features you want your website to have, and dbEasy creates the application for you using the latest web tools. Core technology support by the worlds largest Internet companies so that your dbEasy™ applications will be based on secure and stable technology. Fully functional mobile web applications without going through the time and effort of a large software development project. 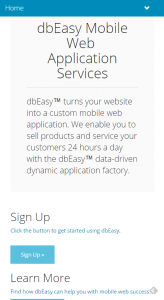 Your customers can use your dbEasy™ applications on any device. Your customers will have the best user experience and you don’t need to hire an IT staff or learn programming. By leveraging the best available technology we at dbEasy™ empower you with the coolest new technology that frees you to focus on running your business. 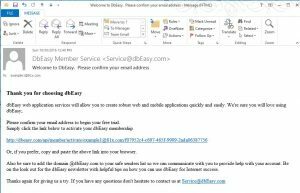 Fill out the form below and we will notify you when dbEasy™ is available to help with your business success. Don’t miss this opportunity to one of the first members of what’s sure to become one of the most popular websites for business success through mobile web application services. A database is any collection of related information, or data, that is organized for convenient access. A sorted collection of baseball cards could be considered a database, but usually we think of databases in a computer. 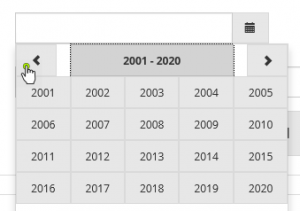 A relational computer database organizes information into related tables with rows and columns. 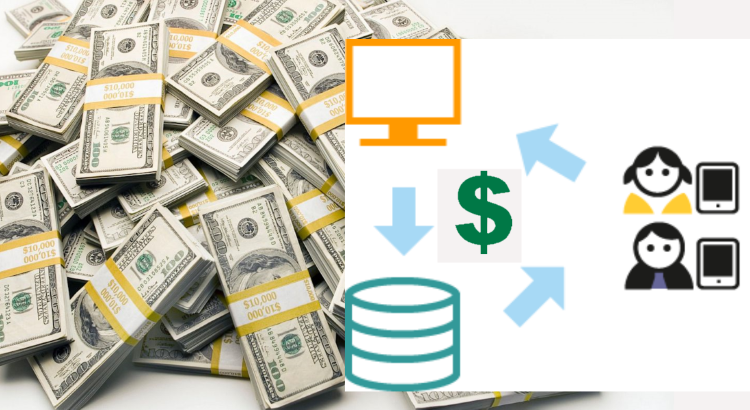 I’m sure that you probably already knew this, but did you know that a database can make you money? The information in your database can be your product to sell. Or a database can reduce your costs. Since profit equals revenue minus expenses then savings in expenses mean more money in your pocket. However, you need customers to take action to gain revenue and a database will help them do that by automating your business processes. 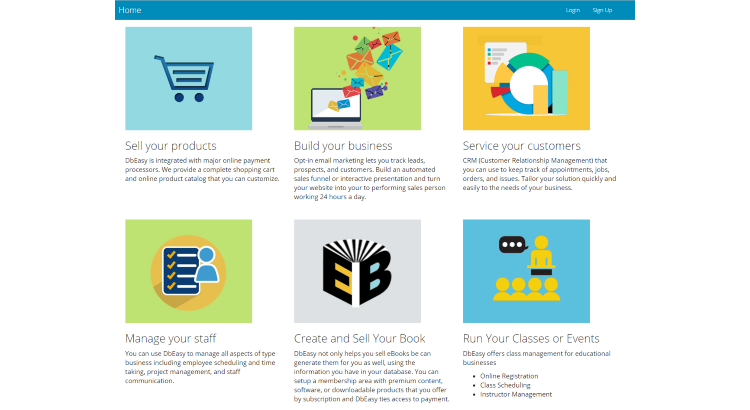 dbEasy is your partner in web business success. There are a few ways that you can use a database to sell information. You can sell subscriptions for members to access the information online. You could also compile the information into an e-book. You could give the information away for free and make money by advertising. 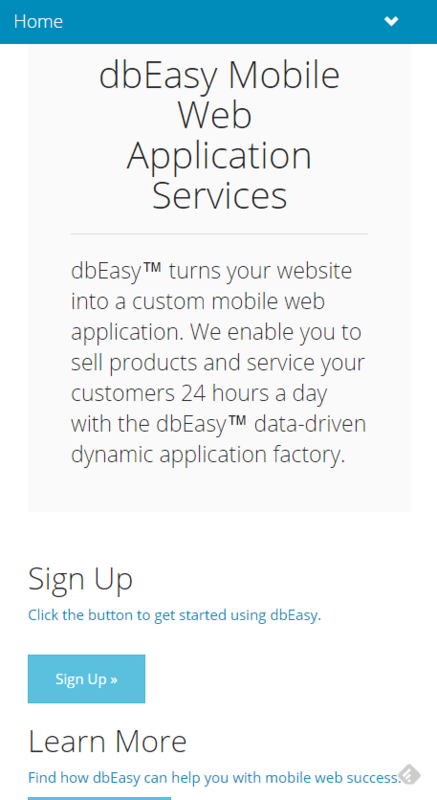 dbEasy hosts your custom database, provides administrative web pages, and rich client apps to embed in your website. This will allow you to serve many more customers with the same staff, saving you money. Finally, a web database can make you money by helping you bring in more income. By automating your order process you can take orders 24/7/365, bringing in income you’d otherwise. Remember, your website is the same distance from your target market as is your competitor’s: one click. When a customer visits your site you need to be able to close the deal. If you’re a hotel you need to take reservations, if you’re a service business then your customers should be able to make appointments, if you’re in real estate then your customers need to be able to see your current listings. 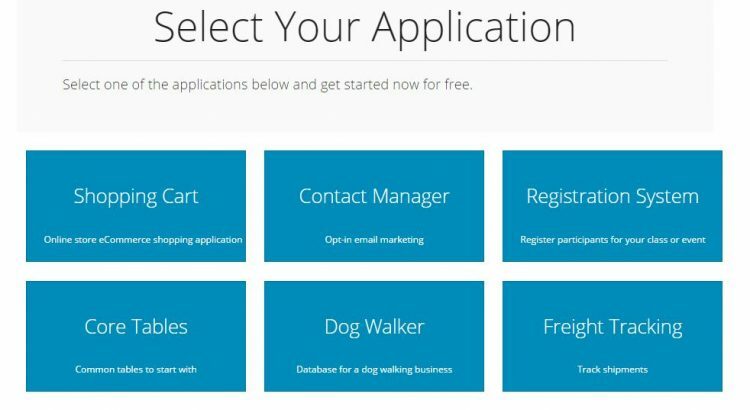 A web database can perform these services automatically, acting as robot workforce, turning website visitors into customers, bringing you money. 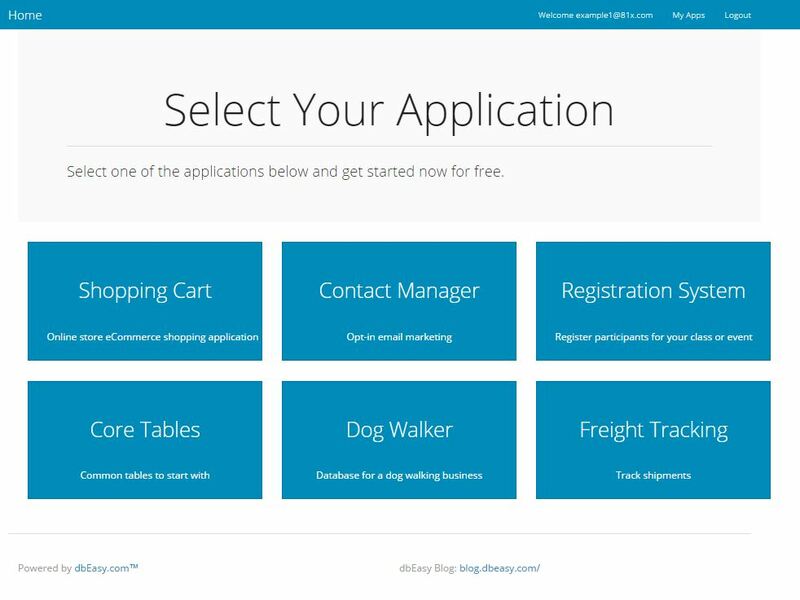 dbEasy is an online web database application creator and hosting service. 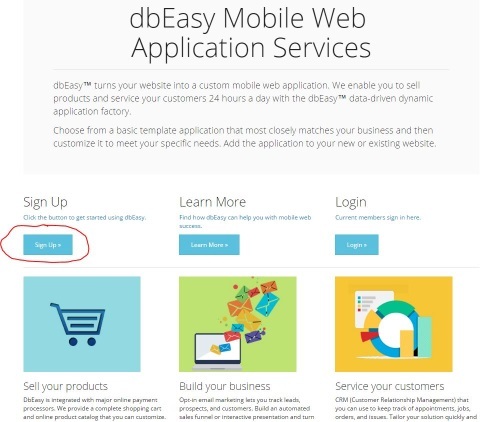 This blog, authored by Ray Wampler, creator of dbEasy, will explain what that means and how you can use hosted web applications on your website to make your business or organization more successful. 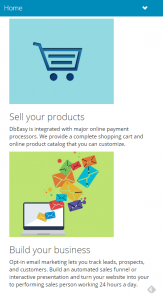 There are several types of people that can benefit from dbEasy. The dbEasy blog will provide helpful how-to articles for each of these audiences and anyone else who can benefit by inexpensive, easy-to-use web database applications. If there is a topic that you would like to hear about, then please let us know by adding your comments below. 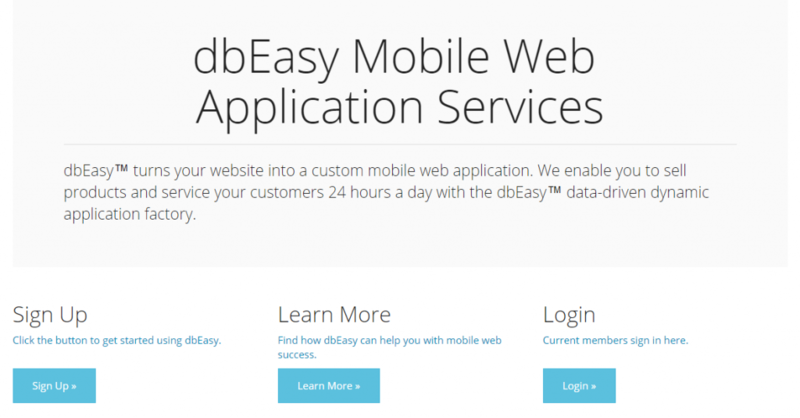 dbEasy creates custom web database applications for you and hosts them too.